Before the 2013-14 NBA season tipped off, Ball So Hard endeavoured to put an end to the debate of who reigns supreme in the league by bringing you the Ball So Hard 50. As the halfway mark of the NBA season approaches, it is time to reflect on the season that has been so far and reassess our rankings. Who has exceeded expectations? Who has fallen short? Find out below. Earlier in his career, Dwyane Wade’s game was best summarised by his nickname “Flash”, lighting up box scores like there was no tomorrow and driving into the lane with reckless abandon. Nowadays, Wade’s production is more flashes of brilliance as all the millage and physical abuse his body has suffered begins to take its toll. That being said, the artist formerly known as Flash is still a devastating force in the league when healthy. This season, the Heat have been extremely cautious as they monitor Wade’s game time, seemingly guiding him through the season wrapped in cotton balls. 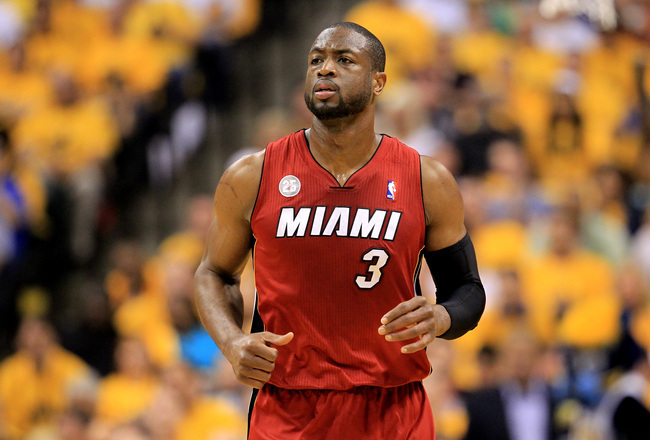 Wade has only played in 32 of a possible 45 games this season, but that doesn’t mean he is having a bad year. It makes sense that the Heat take it slowly with their star player. He’s played in three NBA seasons, making the finals each year, and an Olympic games in the last three seasons. That’s a lot of physical abuse to put on Wade’s already beaten up 32-year-old body. All the rested games aside, when Wade has played he has still been putting up great numbers. This season, the former Marquette Golden Eagle is averaging 18.4 points (seventh amongst shooting guards), 4.7 rebounds (fifth), 4.7 assists (fifth) 1.7 steals (fourth) and 0.6 blocks per game (seventh), and he is also 19th in the league in PER at 21.3. Not his most impressive output, but still nothing to laugh at. Much like his fellow Heatles, LeBron James and Chris Bosh, Wade is shooting a ridiculously efficient percentage from the field (53.8% from the floor, 12th in the league, and a career high 40.0% from beyond the arc), especially for a perimeter player. He might not be the same player that led the NBA in scoring in 2008-09, but Wade is still an All-Star calibre player and a key piece to Miami three-peat aspirations. The Dallas Mavericks are currently clinging onto the eighth seed in the super-competitive Western Conference, and much of that success can be attributed (once again) to their German superstar Dirk Nowitzki. 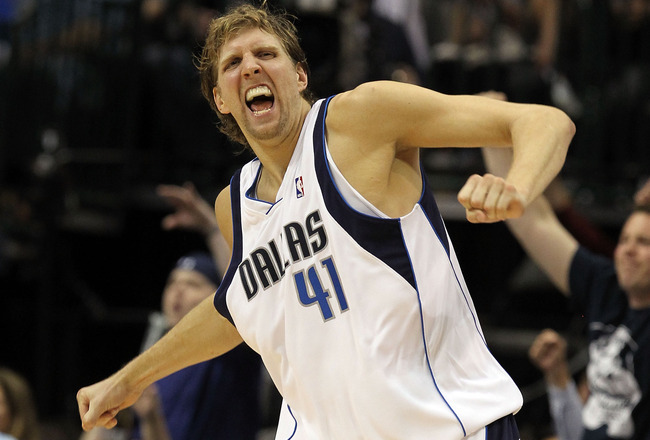 After struggling with injuries and only playing in 53 games last season, Dirk has already suited up for 45 games this year and is having a resurgent season. The one-time NBA Champion is averaging 21.6 points (12th in the league), 6.2 rebounds and 2.9 assists (fifth amongst power forwards), good enough numbers for him to be selected to his 12th All-Star game this year. In his 16th season, Dirk is also flirting with becoming only the second player over 35 to join the 50/40/90 club (where a player shoots 50% from the floor, 40% from three and 90% from the stripe) at 48.3/39.3/90.8 through late January. That free throw percentage is also good enough for second best in the league. With so many fantastic frontcourt players in the Western Conference, the fact that Nowitzki will be playing in the All-Star game (instead of the likes of DeMarcus Cousins and Tim Duncan) is the biggest indication of just how impressive his play has been thus far. After missing out on big name free agents like Deron Williams and Dwight Howard over the past two seasons, Dirk has received little help in keeping the Mavs relevant in the deep West. But as it turns out, that doesn’t seem to be much of an issue. If you thought Nowitzki was having an impressive season despite his age, consider these numbers. 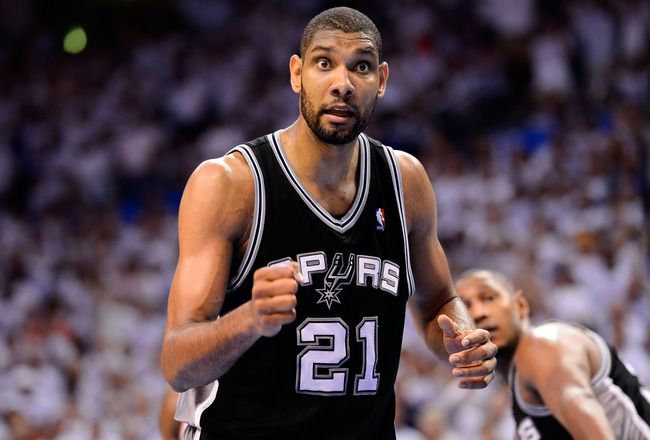 Then consider this: Duncan is almost 38 years old. And if that isn’t enough to convince you, how about this: Duncan is 97th in the league for minutes per game. Less than players like Andrea Bargnani, Amir Johnson and Josh McRoberts. In his 17th season in the league, The Big Fundamental just keeps on ticking along, putting up elite numbers despite his age and heavily limited minutes. Earlier this season, Duncan became the oldest player to have 20 points and 20 rebounds in the same game when he went for 23 and 21 against the Atlanta Hawks, a game in which he also hit the game-winning shot. Oh, and he only played 34 minutes that night. Every year it feels like it is the year that Duncan and the Spurs will slow down, and every year they make everyone look stupid for doubting them. Duncan didn’t make the All-Star game this season, but he wont care, he’s already played in 14 of them. All TD and the Spurs care about is making another deep playoff run. He led them to the Finals last season, who are we to doubt he could do it again this year? Roy Hibbert is the epitome of a player that doesn’t need to dominate box scores to dominate a game of basketball. Much like Andre Iguodala, Hibbert doesn’t make this list because of his statistical production, rather it is his imposing presence on defence that makes him such an good player. The Indiana Pacers have the best defence in the NBA (first in both points allowed and defensive efficiency) and that is in large part thanks to Hibbert’s intimidating presence under the rim. This season, the former Georgetown Hoya is averaging 2.5 blocks per game (second in the league), and has the league’s best defensive rating at 93.9. And while his production in other statistical categories isn’t as imposing, he is no slouch either, averaging 11.8 points (13th for centres), 7.8 rebounds (17th) and 1.4 assists per game (11th). But it is defence where Hibbert hangs his hat, and he a self-proclaimed front runner for Defensive Player of the Year honors. But with 11 games this season with at least five blocks, it is hard to argue with him. 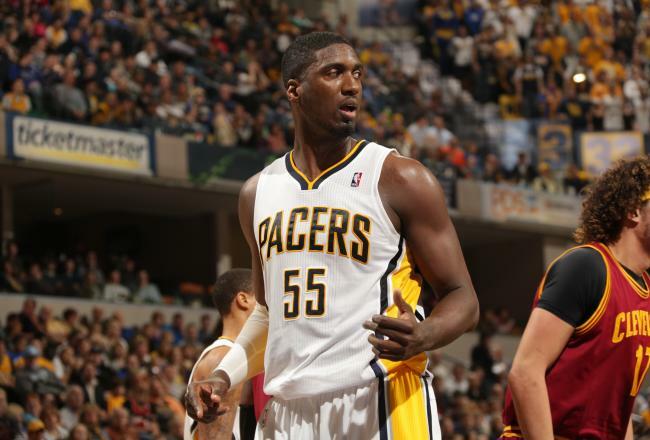 Hibbert’s role on the Pacers is to give the Miami Heat headaches when they inevitably meet in the playoffs. And judging by the way his game has improved this season, it looks like he could be the biggest mismatch Miami has ever faced (no pun intended). Things haven’t changed much in Cleveland since last season. Wins are few and far between, and Kyrie Irving is still putting up All-Star worthy numbers. He was voted into his second All-Star game by the league’s head coaches last week. The Cavs might not be living up to the playoff predictions many expected of them at the beginning of the season, but the losses are no fault of Uncle Drew. The one-time Duke Blue Devil is having another standout season, averaging 21.5 points (13th in the league), 6.2 assists (16th), 3.0 rebounds and 1.3 steals per game. It is hard to blame Irving for much of Cleveland’s failures. The disastrous Andrew Bynum experiment is hardly his fault, and with the sixth highest usage rate (29.2%) it is hard to ask much more of the 21-year-old point guard. His production may have slightly slipped compared to his spectacular sophomore season, but Irving is hardly in a slump. Rather the horrible team that Cleveland’s front office has assembled around him is finally taking it’s toll on the two-time All-Star. Cavs fans will just need to hope that the losing doesn’t drive another star out of town.